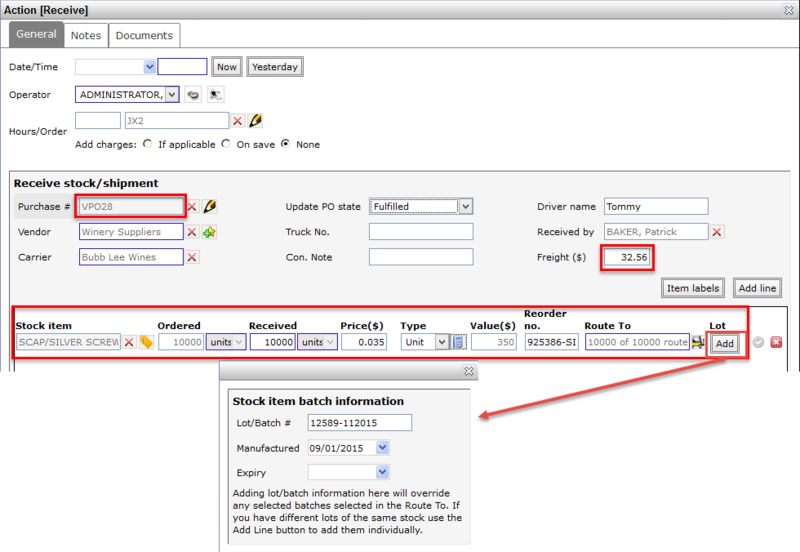 If you are tracking stock levels on any of your non-bulk items, you’ll want to start by receiving some into inventory. From the Inventory menu, choose Receive or click the Operations button at the bottom of any Stock item overview. The areas marked in pink are the mandatory fields; you cannot save this action until those are completed. To find an existing Stock item, use the Search (magnifying glass); to create a new Stock item, use the Add new [+] button. If you have Lot/batch tracking enabled, click the Add button under Lot. If the costs are not available, you may add them later. If you received more than one stock item in a single shipment, you may click the Add Line button. The following screen shot represents a completed stock receipt.